Where Does Oracle Database View v$osstat Get It's Data? Trustworthy? Have you ever wanted to get OS data from within Oracle Database 12c/11g/10g and without being at the OS prompt? Have you ever wondered where v$osstat gets it's data? I have! It's the kind of stuff I think about all the time. In fact, I was so fascinated by what I found, I included the details in my online seminar, Utilization On Steroids. It's that cool. What Is So Great About v$osstat? For starters, v$osstat provides an operating system perspective view of OS activity. In contrast, v$sysstat or v$sys_time_model provide performance data about a specific instance. Looking at v$osstat data is like looking at OS data from within Oracle. In other words, seeing OS data without an OS prompt. Where Does vmstat Get It's Data? There are two things I want to bring to your attention. First is the nonosleep call. If you do a man page on nanosleep, you can see that vmstat is using the call for the two second sleep between data output. The second and the most important for this posting, is vmstat repeatedly references data in the /proc filesystem. I write about the /proc filesystem in my Oracle Performance Firefighting book and also explore it in my Utilization On Steroids online seminar. It's amazing. The bottom line is this, vmstat gets performance data from the /proc filesystem. Place that in your stack and read on. Where Does v$osstat Get Its Data? The Oracle Database background process mmnl, at least in part, is responsible for collecting data that we see in v$osstat. So I am going to OS trace using strace the mmnl process and see what files it opens and reads! First I need to get the OS process ID of the mmnl background process for my Oracle Database 12c instance. Just in the few lines above you can see that the mmnl background process opens and reads data from /proc/cpuinfo, /proc/mounts, /proc/loadavg, /proc/stat, /proc/meminfo, and /proc/vmstat. While a bit scary if you are violating your Oracle Corporation licensing agreement, this is truly fascinating! While my demonstration does not prove this and I have never seen or heard anything to the contrary, it does appear the source of OS data for v$osstat is the /proc filesystem. And certainly, the Oracle Database background process mmnl repeatedly references the /proc filesystem. Therefore, if the source of OS data is the same for both vmstat and v$osstat, I will trust the data from v$osstat unless there is a really good reason to not trust the data. What Can I Do With v$osstat? That's a great question, but not the focus of this posting. But just to give you some ideas, we can easily determine OS CPU utilization solely with $osstat, an AWR report, or a Statspack report. If fact, next week I'm going to give a 30 minute Quick Tip at the 2014 IOUG/Collaborate conference entitled, Calculating OS CPU Utilization From V$ Views, AWR, and Statspack. OK... here is the link where you can download the slide deck for my most recent version of the conference presentation. Utilization is a fascinating topic. It is far reaching and touches on all things computing and even beyond. And as you might expect, I really get into this in my online seminar entitle, Utilization On Steroids. It's the simplest concepts that are the most profound. 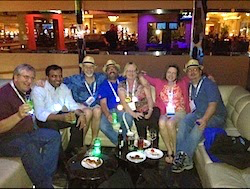 5 Steps For DBAs To Learn More And Work Less Ouch! 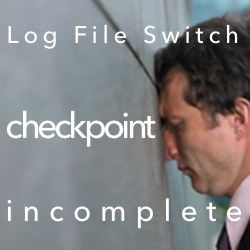 Log File Switch Checkpoint Incomplete Top 7 Reasons Why Oracle Database Conferences Rock!